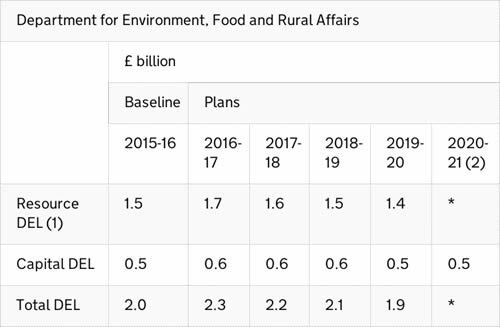 The Chancellor has published the results of the spending review, including details of the Department for Environment, Food and Rural Affairs (Defra) budget over the course of this parliament. The Spending Review and Autumn Statement deliver on the government’s priority to provide security to working people at every stage of their lives. It sets out a 4 year plan to fix the public finances, return the country to surplus and run a healthy economy that starts to pay down the debt. By ensuring Britain’s long term economic security, the government is able to spend £4 trillion on its priorities over the next 4 years. (1) In this table, Resource DEL excludes depreciation. (2) 2020-21 Resource DEL departmental budgets have only been set for some departments. For the rest, these budgets will be set in full at the next Spending Review. The government will continue to prioritise investment in flood defences. The government’s £2.3 billion capital programme will invest in over 1,500 schemes to give 300,000 homes greater security from flooding by 2021. Flood defence maintenance funding will also be protected, and Defra will work with the Environment Agency to generate 10% efficiencies by 2019-20 with all savings reinvested to better protect another 4,000 homes. To maintain its world-class response and recovery capabilities, the government will prioritise spending on animal and plant disease prevention and will invest £130 million capital funding in Defra’s science estates by 2020-21. The government will also continue to invest in implementing its 25-year strategy to eradicate bovine tuberculosis. The government will invest over £3 billion to enhance England’s countryside through the Common Agricultural Policy and funding for public forests will be safeguarded, with 11 million trees planted over the Parliament. Funding for National Parks and Areas of Outstanding Natural Beauty will also be protected, and National Parks will be given legal flexibilities to allow them to build sustainable, long-term revenue streams and boost growth in rural areas. South West Water household customers will continue to benefit from £50 off their bills throughout this Parliament, in recognition of the higher costs faced by water customers in the South West. Through its ambitious efficiencies programme, Defra will become a more streamlined, digital department, sharing back office functions like IT, human resources and finance with its network bodies to reduce unnecessary bureaucracy, and devolving roles to the local frontline to ensure effective service delivery. 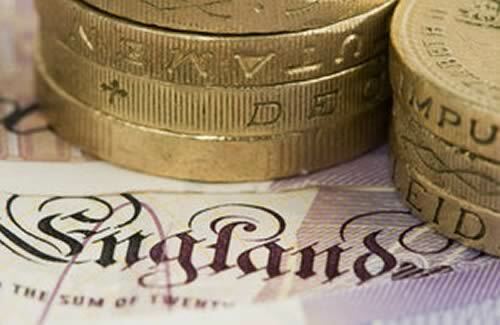 Through this programme, Defra will reduce its administration budgets by 26% by 2019‑20, saving £123 million. Defra will continue to reduce costly bureaucracy and red tape, securing net savings to business of £470 million by the end of the Parliament. As part of this, Defra will set up a Single Farm Inspection Taskforce to reduce the burden on farmers, aiming to cut farm inspections by 20,000 by 2019-20. With today’s settlement we can now plan for the future. This strong funding settlement means we can press ahead with our vital work to protect the country from floods and animal and plant disease, put in place stronger protections for our natural landscape and deliver on our commitments for a cleaner, healthier environment which benefits people and the economy. Everyone has a part to play in eliminating the deficit by 2020 and, through its ambitious programme of efficiencies, Defra will go further to become a more modern organisation, streamlining services and doing things more strategically.